OPINION: A Clean, Sustainable Energy Source Replacing A Polluting, Expensive One. Good For Fiji. Good For Planet Earth. 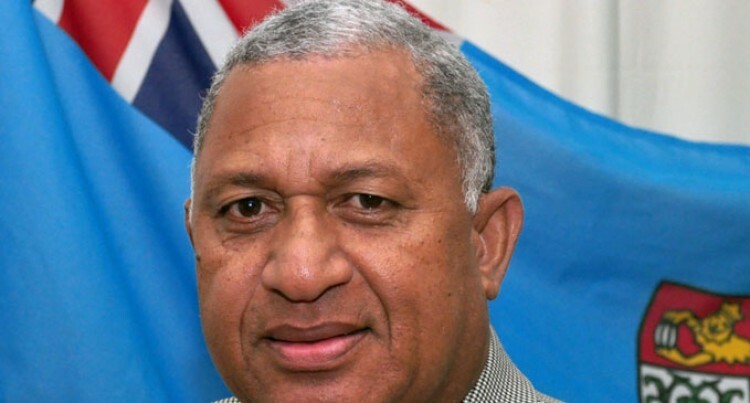 This is the full text of PM Bainimarama, Minister for iTaukei Affairs and Sugar Industry’s keynote address on the occasion of the official opening of the Wainisavulevu Weir Raising project at Naitasiri yesterday. I want to begin by acknowledging the vanua of Naitasiri and thanking you for the warmth of your traditional welcome. Something our overseas visitors and even some locals may not realise is that not every ceremony in Fiji is the same. There are variations across the country and today we have witnessed the unique richness of the culture of the people of Naitasiri – reminding us yet again of the importance of these ceremonies in our national life. Excellencies, ladies and gentlemen, a month out from the World Climate Conference in Paris, I’m delighted to launch a project that will continue to reduce Fiji’s dependence on fossil fuels. And boost our capacity to access hydroelectric power – clean, green energy that is already transforming our economy and on which much of our future prosperity depends. As you know, the burning of fossil fuels – including the use of diesel to generate our electricity – releases the carbon emissions that are warming our planet. And are causing the sea level rises and extreme weather events that pose such a threat to our island nations in the Pacific and other low lying areas of the world. So the expansion of our hydroelectric generating capacity through the upgrading of this reservoir at Wainisavulevu is a wonderful day for Fiji. By raising this weir an additional eight meters, the reservoir can now hold seventeen times more water than it could before. Which means the Wainikasau Hydro power station will generate an additional 10-million units of electricity a year. And save us some $2.5 million dollars a year in diesel fuel. It means more water to supply our energy needs. And yet another reduction in our carbon emissions and our dependence on fuel imports. A clean, sustainable energy source replacing a polluting, expensive one. Good for Fiji. Good for Planet Earth. So Excellencies, ladies and gentlemen, this is a highly appropriate location for me to make an announcement today of national importance that will also have an impact way beyond our shores – the steps Fiji intends to take to reduce its overall contribution to global warming. The cuts we intend to make in our carbon or greenhouse gas emissions that we all pump into the atmosphere when we use fossil fuels. Whether be it petrol for our cars, gas for our cooking or diesel to generate power or take the bus to school. Before I do so, it’s important that I put this announcement in context. Because this is a global issue, not just confined to Fiji and the Pacific. As I pointed out last week, the average Fijian is generating five times less carbon than the average person in the rest of the world. Our per capita carbon emissions in 2013 was anestimated 1.5 tonnescompared to a global average of 5.6 tonnes. So it is clearly the industrial nations, not us, who are largely responsible for the alarming rise in global temperatures that threaten our way of life here in the Pacific. We haven’t caused the problem and unlike the nations who benefited from the industrial revolution, we certainly haven’t got rich on carbon. Yet along with the other small island developing States and low-lying areas of the world, it is we who are having to carry the greatest burden. This includes the potential loss of whole nations in the Pacific which are low lying atolls plus the loss of vast areas of fertile coastal land in countries such as Fiji. So let me be very clear: it is not our fault. It is the responsibility of the industrialised nations as they pursuehigher living standards for their people at our expense. And at the expense of the global environment and the sustainability of our planet. Yet for all that, climate change is a global problem. And even small nations such as Fiji have a responsibility to do everything possible to reduce our own carbon emissions. To be team players and work with the rest of the world to confront the greatest challenge the world has ever faced. Which is why today is a very important day for Fiji. As we announce our own contribution to reducing carbon emissions – the target we are taking to Paris along with the other nations. Our Intended Nationally Determined Contribution or INDC. Excellencies, ladies and gentlemen, Fiji is committed to reducing its carbon emissions by 30 per cent by 2030. I repeat: 30 per cent over the next 15 years from Business As Usual – an internationally accepted benchmark that is being used by all the island nations and a number of bigger countries such as Korea and Indonesia. This is an enormous commitment for a nation of our size and stage of development. Proportionally, it is a much bigger sacrifice than a 30 per cent commitment by any industrialised nation. Because we are starting from such a low base with almost negligible carbon emissions in the first place. In fact, Fiji’s total share of global emissions is zero-point-zero-zero-four per cent (0.004%) As I say, not our fault but we are still prepared to share responsibility. As I mentioned before, we are already generating five times fewer emissions per capita than the average in the rest of the world. So a further 30 per cent off that 1.5 tonnes is much more than the average global citizen – at 5.6 tonnes – would have to bear when adopting the same target. How are we going to do it? By drastically reducing carbon emissions in our energy sector. By 2030, we intend to generate 99 per cent of our electricity needs from renewable sources such as water or the sun, up from around 60 per cent in 2013. Which is why the project I am launching today and others like it are so important for our nation’s future. Clean energy. Renewable energy. That doesn’t generate carbon emissions from burning fuel at all. Excellencies, ladies and gentlemen, I can assure Fiji and the world that we have put a lot of thought and effort into formulating our target for Paris. All along, I have been mindful that I cannot appeal to other countries for deep and binding cuts in carbon emissions if Fiji is unwilling to play its own part in confronting the grave collective challenge we face. I am proud to say that as Fijians, we are meeting that challenge head on. Our target is responsible, it is achievable and it is fair. It is certainly the best that we can do within the constraints we face as a developing country and the responsibility we have to our own people.Not to needlessly constrain their living standards and the opportunities they deserve that the citizens of industrial nations already enjoy. Excellencies, ladies and gentlemen, Fiji is convinced that by taking a responsible development path, we can improve those living standards and still meet our international obligations. We have made the sustainable development of our resources on land and at sea our number one national priority. We are putting the preservation of our natural environment above all else. And this principle underpins our Green Growth Framework that we unveiled this year. And will be incorporated into the five and twenty year national development plans which we are now in the process of formulating.So Fiji is playing its part and so are the other island nations. And it is time for other countries to play theirs. Excellencies, ladies and gentlemen, last week I singled out Australia and New Zealand for special mention and especially Australia, which has the highest per capita carbon emissions in the world. But today, as I have before,I ask again, the rest of the industrialised world to do more. I specifically ask all nations to agree to the provisions of the recent Suva Declaration, which sets a limit of 1.5 degrees centigrade warming on pre-industrial levels, rather than the 2 degrees target that is currently on the agenda in Paris. And for these cuts to be legally binding on the global community. Fiji is deeply concerned at the expert opinion warning that the current INDC reductions being submitted for Paris will exceed even the 2 degree limit. A much more drastic approach is clearly needed. And I ask the diplomatic representatives present today to convey our deepest concerns to your governments that not nearly enough is being done to avert catastrophe. Excellencies, ladies and gentlemen, what you see here today is the way of the future – Fiji harnessing nature to provide us with our clean energy needs. Not only are we going to generate 10-million more units of electricity of year from the Wainikasau Hydro power station, the benefits go further. This same water is then discharged into the Monasavu Dam and then reused to generate electricity again at the Wailoa Power Station, saving more in diesel costs. I want to close by thanking the FEA for its own commitment to “energise the nation” and meet the strict guidelines the Government has set for the development of a sustainable, reliable and consistent electricity supply across the nation. We are progressively turning on the power for many thousands of ordinary Fijians. And I’m pleased to say that in Ra, we aim to cover the corridor between Rakiraki and Korovou by August of next year. We have also redoubled our efforts to bring power to Taveuni, and should complete the first phase there by the first quarter of 2016. I also want to acknowledge the contribution of the Chinese Contractor, Sinohydro Corporation and the Consulting Engineers, MWH of New Zealand, for their work in enhancing the Monasavu Hydro scheme. And finally, vinaka vakalevu to the people of the various Yavusas in the Province of Naitasiri for their co-operation and assistance. It is a great day for the people of the province and for every Fijian. A day to celebrate the benefits of clean energy. A day to celebrate our own efforts to produce a more sustainable world. And I now have great pleasure in declaring the Wainisavulevu Weir Raising Project open.